And as always, we feature content from the MGI data and analysis platform, a summary of the week’s key statistical releases, and a look at the week ahead in data. 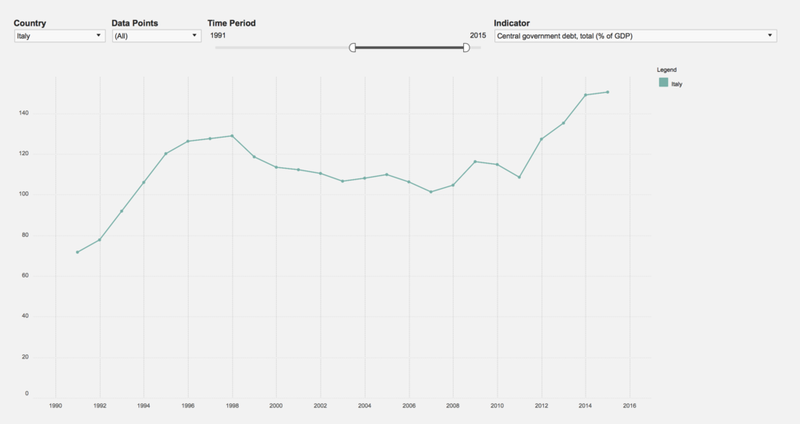 This week, we use the WB section of the MGI platform to look at the evolution of central government debt (as % of GDP) in Italy. €578 million ($717 million) is being provided by the EU to help build a – 370 km long – power link between Spain and France. According to Reuters, the European Commission wants the power connection to help support the uptake of renewable energy in both countries, reduce the continent’s dependence on Russian gas and help it achieve its climate goals. The grant will be drawn from a total budget of €873 million for energy infrastructure projects in the EU – which include, among other projects, a €101 million grant for the introduction of natural gas in Cyprus and €3.7 million for a study on a possible Malta-Italy gas connection. Egypt secured its biggest non-oil foreign direct investment deal since floating the pound in November 2016, with the Al Ghurair Group agreeing to invest $333 million into a new sugar factory and farm. Egypt has been harbouring hopes of a revival in foreign investment to help boost growth and create jobs, with overseas investors carefully tracking the food, health and education sectors to capitalise on its 96 million population. The new factory will produce one million tons of sugar annually which is enough to plug four fifths of the current production gap, according to the government. With voting just a little over one month away, Italy’s Economy Minister stated that the next government must focus on reducing the country’s debt. Carlo Padoan, who will be standing at the election, stated that “the emphasis in the coming years, in the next legislature, needs above all to be on a mechanism that guarantees a constant and credible fall in the debt”. Italy, the second most indebted country in the eurozone with a debt-to-GDP ratio of 132%, failed to reduce its public debt under the current government, Reuters reports. In this newsletter, we use the MGI platform (WB section) to look at the historical evolution of central government debt (% of GDP) in Italy. The period under review is 1991-2015. As shown in the graph, the ratio was relatively low in 1991 (72% of GDP), showed a positive trend until 1998 (when it reached 129%) and remained below 120% over the next 13 years. In the years after 2011, the debt-to-GDP ratio rose significantly, reaching 150% of GDP in 2015. Next week, we expect data for business and consumer confidence, Manufacturing PMI and PPI for some Mediterranean countries, as well as preliminary real GDP data for Spain and France. MGI’s complete data release schedule can be viewed at our release calendar section.